How many of you are looking forward to back to school right now?!? One of the things I always felt uneasy about with back to school was trying to let my child’s teacher know some key things about him, right at the start of the year. We were often encouraged to wait until an IEP meeting, however those don’t typically happen until a few weeks into the school year. I wrote a letter one year. I created a little (big) chart another. I wrote another letter along with a face to face another year. It all seemed overwhelming – for me AND for the teacher. So I was thinking… What if we had a “cheat sheet” that we could give our child’s teacher on the first day of school. Not something five pages long (although you will likely have one of these sent home from the school to complete at some point). No, I’m talking about a quick and BRIEF info sheet that highlights some very key things about your child that you believe are important for the teacher to know. Well, you know what happens when I start thinking about something…it doesn’t take long before I start creating! First though, I wanted to check with some educators to find out what kind of information they would like to have from parents on the first day. I had a few of my contacts send me their thoughts, and I incorporated these into the Info Sheet. We had some interesting conversations about the importance of communication right from day one. I reflected that on those first days of school, I was always hesitant to approach the teacher because I knew he/she would be very busy with getting everything started with the new school year. I worried that I would overwhelm them (see above) or worse, I would scare them with too many details. I was also concerned about how I would be perceived as a parent. When we share information about our child, we put ourselves in a very vulnerable position. One of the hardest things we do is trust the people we are sharing information with. Most of the time it works out, but other times, well…those experiences sit with us. The teachers I connected with shared that they often want to hear from parents, but they don’t want to push for too much information for fear they be perceived as asking questions that are too personal. They want to work in partnership with parents, but those first days of communication can sometimes be difficult. 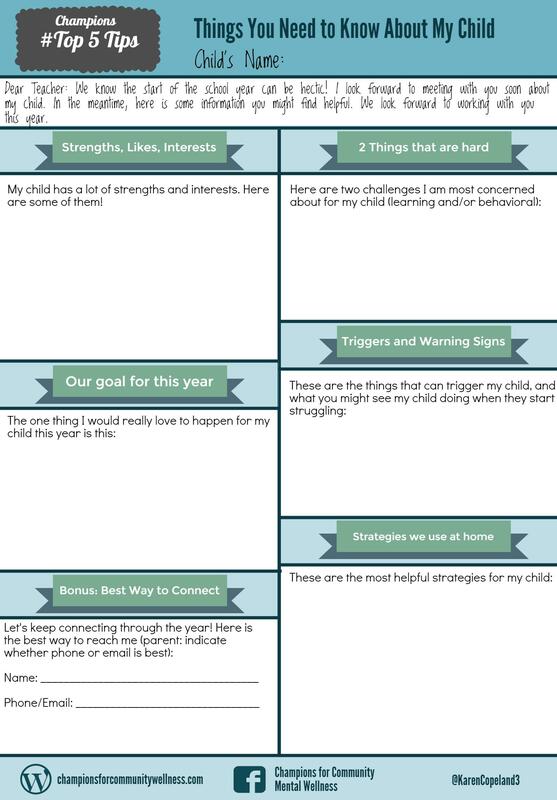 I’m hoping this Info Sheet can act as a catalyst to building a strong foundation of communication and collaboration between you and your child’s school this upcoming year. You can print it off and complete each section with information relevant to your child. A few things. The spaces are small, and that is on purpose. The goal here is to be as specific, but brief as possible with the information you share. It is just a snap shot, giving your child’s teacher a quick overview, in advance of more in depth information sharing that will come later. The largest space on the Info sheet is to write down your child’s strengths and interests. That’s on purpose! 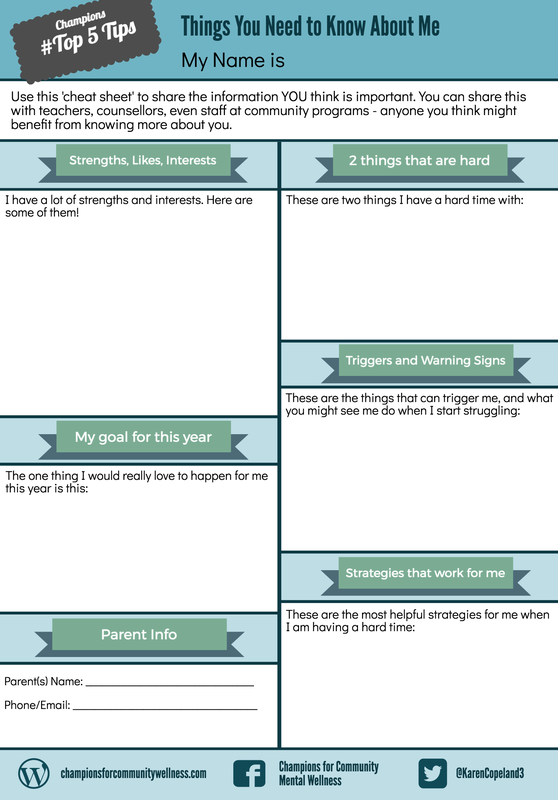 Fill that space up – and make sure you celebrate all those strengths with your child. 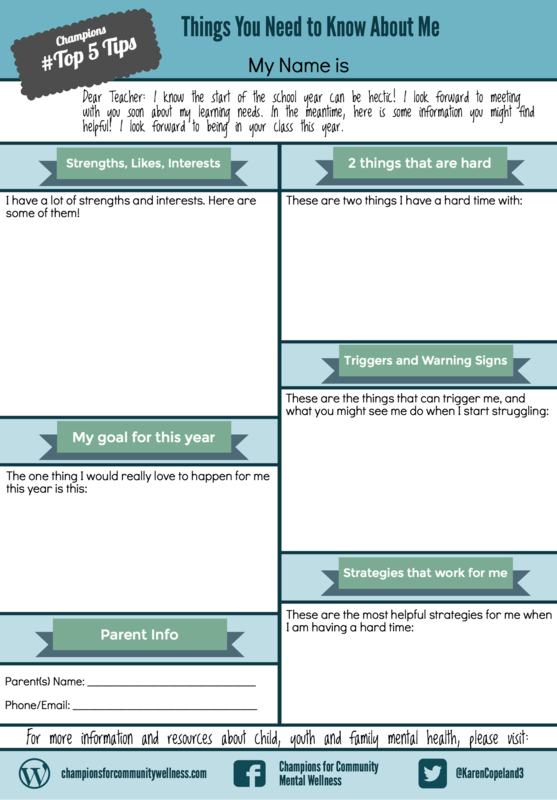 I hope you will find this to be a helpful tool as you prepare for back to school with your child. Don’t forget to check out the other Champions Tip Sheets on the #Top 5 Tips page. Is your child older and ready to venture into advocating for him/herself? Here is a cheat sheet just for them! Greatly appreciate the one for self-advocates as well – we’re working hard on this in our household! I believe it is so incredibly important for older children and youth to have the opportunity to share their thoughts and ideas.